Why did an Indian Muslim become a cow protector? In the narrow lanes of old Delhi, I struggled to keep pace with a middle-aged Muslim man who was clearly in a hurry. It was Tuesday - a day considered holy by many Hindus - and we approached a popular temple in blistering heat. We headed towards a huge cow shelter in the basement of the temple. Dildar Hussain Beg told me he visited the temple every Tuesday after offering prayers in the nearby mosque to look after more than two dozen cows. "I have been coming here for more than 10 years and these cows are my family. I also visit several other cow shelters regularly," he said. But Mr Beg does not just visit cows, he also protects them. Along with a few of his neighbours, Mr Beg has formed a small organisation called Muslim Gauraksha Dal (Muslim Cow Protectors) and is trying to "educate" members of his community to stop eating beef. "Cow protectors" in India have been in the news for a series of assaults on people transporting cows. Many of the attacks have been against Muslims, while the cow protection squads are overwhelmingly Hindu. The cow is considered sacred by Hindus and killing the animal is illegal in several states. But beef is eaten in other communities, including by Muslims, in India. 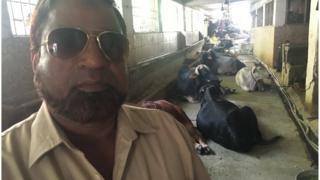 Mr Beg is among a small group of Muslims who run shelters to look after cows. Generations of some Muslim families have also looked after cows in shelters owned by Hindus. "My community has been constantly accused of indulging in cow slaughter in India. If Muslims don't come forward and renounce cow-slaughter, who else will?" he says. Besides working regularly in this cow shelter, he says he travels extensively to other parts of the country to "sensitise his community against cow slaughter and abolish the practice of eating cow meat". He says he has held camps in the central Indian state of Madhya Pradesh to spread awareness and, like many other Hindu cow vigilantes, he claims to have informed local police about the illegal transportation of cows in and around Delhi. He denies that he is doing this for "publicity". "I don't believe in any political party and even fought the last parliamentary election as an independent candidate. People from my own community did mock me initially when I urged them to abstain from cow meat but we don't care," he says. His family supports his cause. Mr Beg's wife, Shaheen Begum, says initially his idea of becoming a cow protector came as a surprise. "I probably took the least time to agree with his cause because I never liked eating beef and always preferred chicken or fish," she said. But reactions from other relatives have been mixed. "Most of the people in our circle don't eat cow meat. A few people initially asked why he attends cow-protection workshops. But nobody asks about it anymore," she said. "Some feel he is trying to grab attention but then step back when they hear that he promotes buffalo meat or lamb as a form of nutrition instead of cow." India has seen an alarming rise in incidents related to cow vigilantism, more so after the Hindu nationalist BJP came to power in 2014. In 2015 a Muslim man was lynched for allegedly storing and consuming beef. At least half a dozen attacks on people transporting cows have been reported across the country. Opposition parties have been scathing in their criticism, prompting Prime Minister Narendra Modi to criticise such vigilantes, saying they made him "angry". But this appears to have had very little impact on the ground. Most recently, a group of Muslim dairy farmers were beaten on a national highway, allegedly by cow vigilantes, for transporting cows from a cattle fair. One of the victims, a 55-year-old man, later died in hospital. In a recent report Human Rights Watch urged action against those responsible for such attacks. "Self-appointed cow protestors driven by irresponsible populism are killing people and terrorising minority communities," the organisation's South Asia Director Meenakshi Ganguly said. But Mr Beg believes that Muslims too can prevent the situation from escalating. "It's very simple. If the majority community in my country is uncomfortable with us eating cow, why do it?" "I have no problems at all with Muslims eating buffalo meat and encourage them to do so. But we are a minority community and have to be considerate towards Hindus who are in the majority. "If they consider cows holy, why kill it? That too when buffalo meat is legally available," he explains.